I don’t know whether you have realised that this country is undergoing a revolution, the youth revolution. Yes, we are making way for the young and replacing the old dusty generations of managers and politicians with fresh, vital new forces. Would you believe it? Here is an example: our new Prime Minister Matteo Renzi. Actually, this renewal process had already started when we got rid of old serious Professor Monti for the much younger Letta, who was only 46 – a toddler for our standards – but that was not enough: only after few months he was brutally replaced by Matteo Renzi, democrat, age 38. In his first speech at the senate for the vote of confidence, the Prime Minister did his best to look at ease in such a formal place: unbuttoned jacket, a hand in his pocket and Haruki Murakami‘s The Art of Running well displayed in front of him as sign of the new dynamic times, then, nonchalantly he slapped with the arrogance of his youth the silent and astounded senators, informing them that their time was over, as he was planning to wipe out that chamber soon, reforming the Constitution. Ah, the impetuosity of the young! Oh, giovinezza, giovinezza!!! Therefore, now if you want to have a career in politics and access to the seats that really count, you’ve got to be young or at least look young ( Professor Berlusconi could lecture us upon this point), that means being active, vigorous, energetic…...I don’t know, these words seem to evoke something, but what? It seems as if I have already heard this kind of slogans. However, our politicians have quickly dusted their trainers and tracksuits and started to exhibit their sporting talents, so you can see pictures of them, while they are enduring hard sessions of push-ups, sit-ups, morning runs.There is a Montecitorio running club, in fact, whose membership have recently boomed. 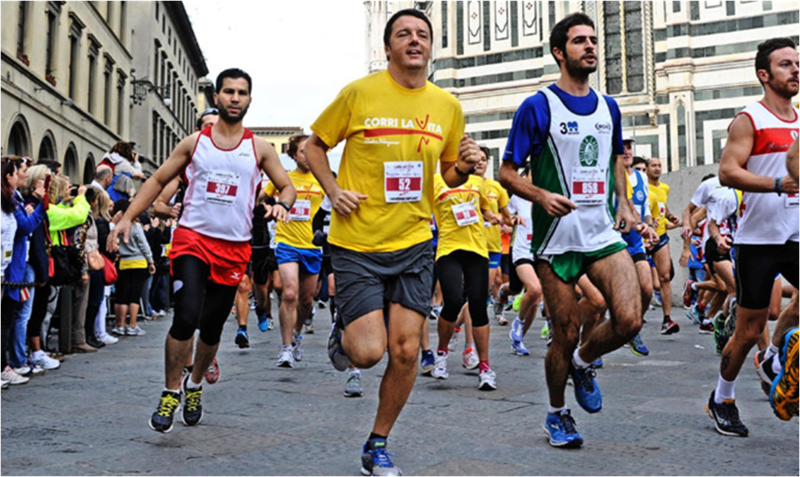 Matteo Renzi himself is a runner or maybe used to be, as he seems to have put some weight on lately. All the members of his staff are young, as for example Maria Elena Boschi Minister of Constitutional Reforms and Relations with Parliament, age 33, she is also very attractive as a matter of fact. However, they represent the dynamic,vital, fresh blood that promises to transform this country. Ahh, giovinezza, giovinezza! Matteo Renzi had formerly been Mayor of Florence, and I have to admit that he did really well. The city looked so organized, clean, so “North” let me say. At this point I feel like tranquilizing whoever is going to come here to Rome for Easter holidays, we are still fully in the disorganized “South”, don’t be alarmed! Nothing has changed. But let me think, how old is our Mayor Ignazio Marino? 59? You see!!! The current Mayor of Florence is Dario Nardella, age 38, and very much alike Matteo Renzi. 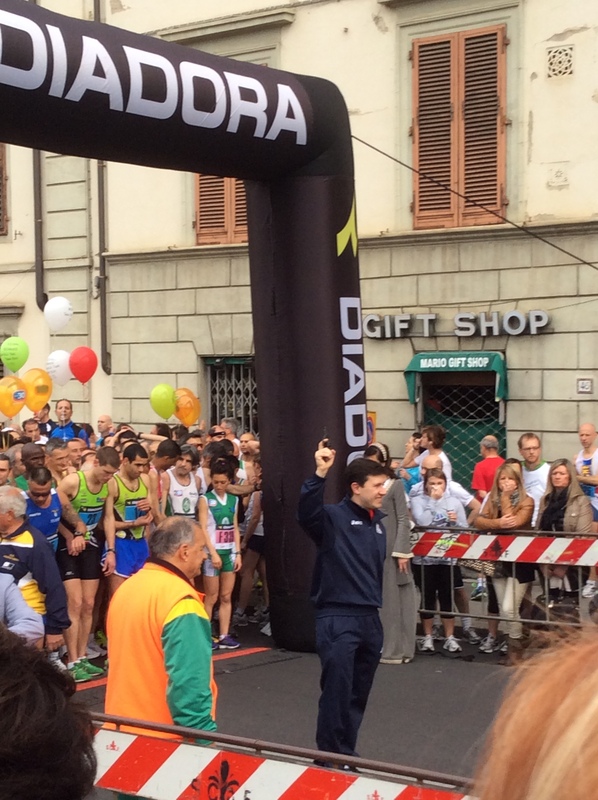 You can see him at the starting line of Florence half marathon two weeks ago. Sporty Mayor Nardella. Does he have a hand in his pocket? Must be a distinctive mark. 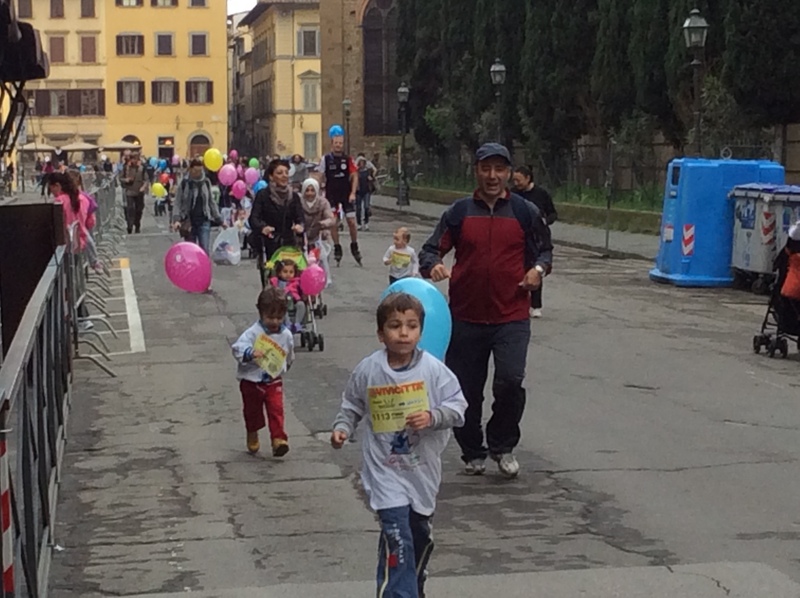 Fresher blood running through the streets of Florence. The little boy here, may be the next Prime Minister soon! Now I remember. This is not the first time, in fact, that this country celebrates the boost of youth. Actually, it was long time ago, and the Prime Minister was, was…………… The Dux, Benito Mussolini. Ahhhhhh, giovinezza, giovinezza!!! 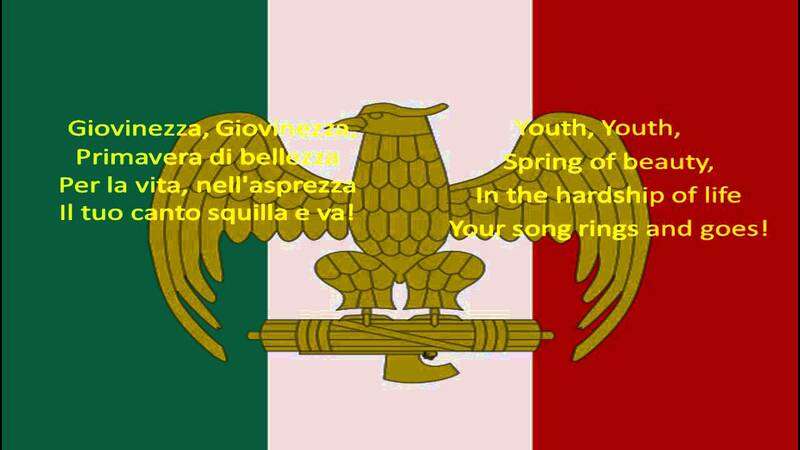 Giovinezza is the official hymn of the Italian National Fascist Party, regime, and army, and was the unofficial national anthem of Italy between 1924 and 1943. This entry was posted in culture and society, Running and tagged Florence, giovinezza, Haruki Murakami, Renzi by etinkerbell. Bookmark the permalink. Thanks for teaching me, Stefi. Yes, the teaching instinct is strong, I can see. Happy Easter to you, too, Stefy! Youth is a dubious quality. I have just been looking at your syllabus pages. I wish I had a teacher like you! Stefy such an interesting turn in the politics of Italy. Are most Italians keen on this move to the youth? On another note wasn’t that a wonderful note written on your blog by your former student in response to my comment? Did you see it? Well deserved and so heart warming to see the results of your efforts in real life. I saw it Sue, in fact my new nickname is Mrs Fabulous (former Mrs Run). I answered and thanked you both yesterday morning (Rome time) for you lovely words. You made my day. Will you stay in Canada or are you planning to go somewhere? A thought-provoking post, Stefy. Youth can and does have enthusiasm, vigour and idealism on its side — if only, with the passage of years, it didn’t too often stultify into pragmatism, laziness and cynicism! I see it as a chance, in fact. Let’s see where such youthful enthusiasm will take this country. Have a nice Easter Chris. I think that we are always young enough in order to live passionately… By the way, I am thinking in Wilde´s “Portrait of Dorian Gray “now… Sigh .. Excellent post and I loved to to follow the Marathon through the pictures you have taken. The amazing ability of humans to have one extreme in mind at all times. Too old, or too young. From dodderers to immature hotheads. Trouble is, it takes ages to figure out that the whizz-kids generally have a vroom-fizzle solution. Stefy, I think that age has nothing what to do with good governing. For the last 40 years the best American president was the oldest one. I would ask: how much governing experience your new leaders have, what are they political and economic platforms, who supported and elected them (unions, business, etc.)? Only then a judgement can be made. It was a real kicker at the end, wrapping up with the slogan of the Fascist party. I hope no similar trend emerges, but disbanding the senate? Hmm. Lots of undercurrents in this post. I hope all goes well. Thanks for all the interesting info!